Within Teamwork Desk, you can choose to enable or disable custom fields that you have created at anytime. To do this, click on your profile icon to the top right of the navigation bar and select Settings. In the settings area, go to the Company tab. 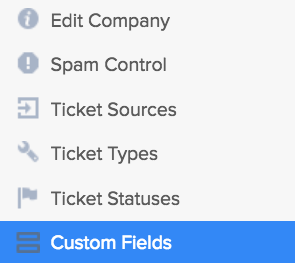 In the left pane select Ticket Fields. You will then be presented with a list of system fields and custom fields. Note: You will not have the option to disable system fields. To enable, toggle the button to the far right of each custom field you have created.